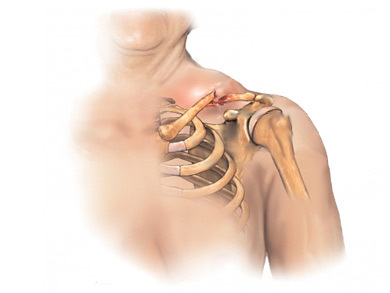 A clavicle fracture is a break in the clavicle bone (also called the collarbone). It connects the sternum (breastplate) to the shoulder. The doctor will ask about your symptoms, physical activity, and how the injury occurred. The injured area will be examined. Most clavicle fractures can be treated either with a figure-of-eight strap, which is wrapped around the body and the shoulders, or with the arm in a sling. These devices help hold the shoulder in place while the clavicle heals. The doctor may prescribe pain medication. Surgery may rarely be needed to set the bone. The doctor may insert pins or a plate and screws in the bone to hold it in place while it heals. A sling or figure-of-eight strap will be needed while you heal. A physical therapist can help with shoulder range-of-motion and strengthening exercises. A child may heal as quickly as 3-4 weeks. An adolescent may take 6-8 weeks to heal. An adult may require 8-10 weeks to heal. A lump at the fracture site may persist for years. Do not put yourself at risk for trauma to the clavicle bone. Clavicle fracture—emergency management. EBSCO DynaMed Plus website. Available at: https://www.dynamed.com/topics/dmp~AN~T903976/Clavicle-fracture-emergency-management . Accessed August 24, 2017. Lenza M, Belloti JC, Andriolo RB, Gomes Dos Santos JB, Faloppa F. Conservative interventions for treating middle third clavicle fractures in adolescents and adults. Cochrane Database Syst Rev. 2009 Apr 15;(2):CD007121. Shoulder trauma. Ortho Info—American Academy of Orthopaedic Surgeons website. Available at: http://orthoinfo.aaos.org/topic.cfm?topic=A00394 . Updated September 2007. Accessed August 24, 2017. Stegeman SA, de Jong M, Sier CF, et al. Displaced midshaft fractures of the clavicle: nonoperative treatment versus plate fixation (Sleutel-TRIAL). A multicentre randomised controlled trial. BMC Musculoskelet Disord. 2011 Aug 24;12:196. Vander Have KL, Perdue AM, Caird MS, Farley FA. Operative versus nonoperative treatment of midshaft clavicle fractures in adolescents. J Pediatr Orthop. 2010 Jun;30(4):307-312. 8/20/2013 DynaMed's Systematic Literature Surveillance https://www.dynamed.com/topics/dmp~AN~T114297/Buckle-fracture-of-distal-radius : Joshi N, Lira A, Mehta N. Diagnostic accuracy of history, physical examination, and bedside ultrasound for diagnosis of extremity fractures in the emergency department. Acad Emerg Med. 2013 Jan;20(1):1-15.